Handmade Gifts for Mom That She Will Love! If you are looking for some creative ideas for a meaningful handmade gift for mom, then look no further. 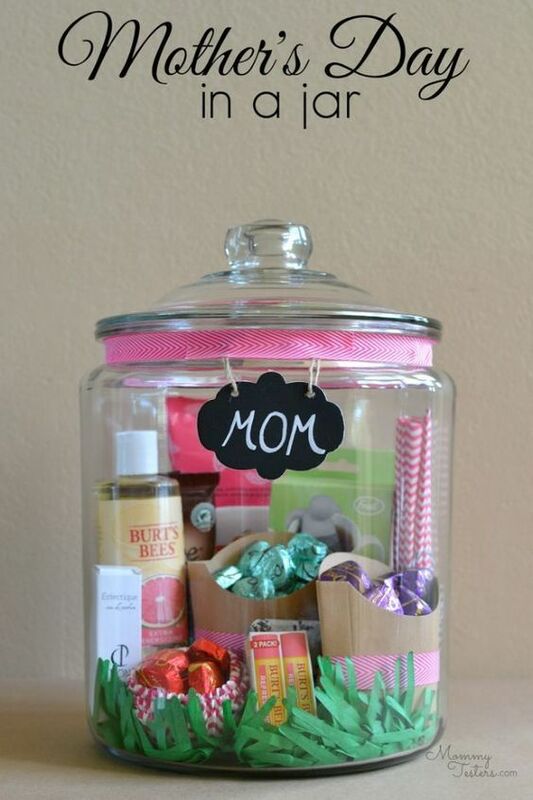 Below is a list of the best homemade gift ideas for mom, that you can make yourself! Nothing can beat a personalized gift for mom! Granted you can head to the store and buy her some chocolates , her favorite perfume , or something else she likes, but sometimes those handmade gifts stand out the most. It shows that you took the time to create a gift, and show her how much you love her. Surprise your mom with one of these one of a kind gifts that will be irreplaceable in her heart! Here are some amazing ideas we found that will make it easy for you to get started on your homemade and handmade gift for mom before time runs out! 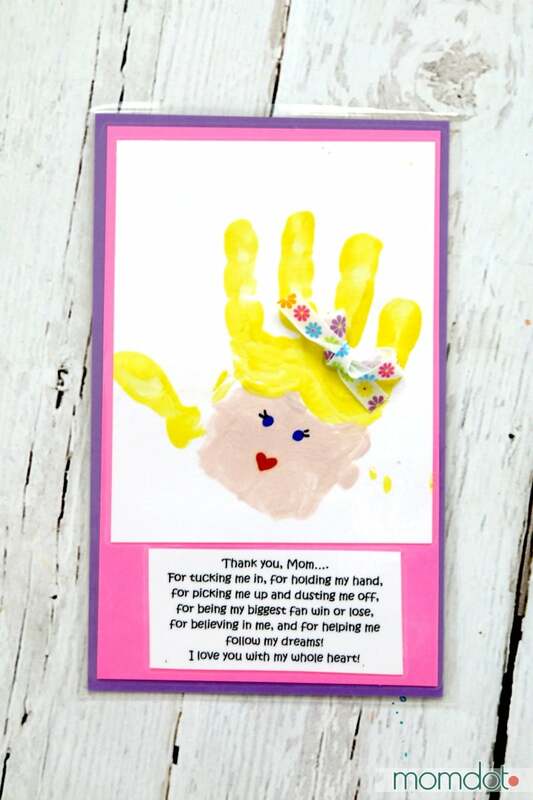 Mothers Day Hand print with Free Printable (MomDot): Print off this printable and just add hand for an adorable poem that will make mom tear up and hide in her memory box. Hand Print Flowers (Wall Fry): Let your little one get involved, with this adorable hand print flower bouquet! With a little help they can create a custom bouquet of flowers to melt mom’s heart. Easy Mom Paint Craft (The Educators Spin on It): Tape off the letters Mom on some paper or even better a canvas, and let your kids paint away. Then peel off the letters to see the word Mom put on display by beautiful paint art that your child made! Great for younger and older kids to get creative and have some fun! Love You Hands Print (Lil Luna): Grab a pretty picture frame, and with some paint you can create this adorable, Love you hand print framed art! Just use the free printable, and then add your hand prints to it, and pop it in a frame. Great for a last minute gift for mom. Plant Memories for Mom (The Neighborhood Mom): An old shoe and some new flowers is all you need to create a one of a kind planter that will leave mom smiling every time she gardens. Intrigued? Check it out here. Wood Slice Family Hand Prints (Made to Be a Momma): Grab some different paints, and then let each family member add their hand print onto the wood slice. This is a great piece that can be displayed. You can do just the kids or mom, dad, and kids! Butterfly and Bumble Bee Towels (Creative Green Living): Create these adorable hand towels made out of your child’s footprints. You can make bumble bees or butterflies, or do both! This is such a fun and creative gift for mom! Plus your kids will surely enjoy playing in some paint! Mothers Day Gifts in a Jar: (Hello Splendid): Add all of moms favorite things in a jar, plus she has the added affect of keeping that jar when the gifts are gone. This is a fun tutorial that is worth a look today! Sugar Scrubs (Reasons to Skip the Housework): Nothing beats a good sugar scrub, to get your skin feeling silky smooth! Let your kids help create homemade sugar scrubs, to pamper your mom for all the hard work she does! Fizzy Scented Bath Bombs (Play Dough to Plato): If you are a little crafty, create your own fizzy scented bath bombs. You can use any scents your mom likes! Some of my favorites are peppermint, lavender, spearmint, clove, and more. Just grab your favorite essential oils to create the scents you desire. Lemon Poppyseed Scrub (Sugar, Spice, and Glitter): Takes only minutes to give mom the pampering she deserves. Pass on the gift of smelling and feeling beautiful with this easy to make Lemon Poppyseed Scrub, that will give her a fresh from the shower skin. Pop in a mason jar to make it special! Homemade Bath Salts (DIY Inspired): Grab some Epsom salt, essential oils, and these adorable test tube containers, and create fragrant bath salts for your mom to take time to relax in the bath! Breakfast in Bed Tray (Alpha Mom): Pamper your mom with a breakfast in bed on a one-of-a-kind breakfast tray. Let your child create a fun tray for mom, with a little note or art work to make her feel extra special! Homemade Lotions (Coupon Closet): Create homemade lotion with just 3 simple ingredients! You can use essential oils to create a smell that fits your mom! They use lavender in this recipe, which is great for relaxation, but you can always substitute a different scent if you choose. Lavender Oatmeal Soap DIY (Beauty Crafter): This is an easy lavender oatmeal soap recipe using melt and pour soap base and a perfect way to create mom something special, even if you are a beginner. Mom loves homemade! Jar Lid Picture Magnets (the 36th Avenue): What a fun way to use old jar lids! Create one of a kind picture magnets to hang on your fridge. Add some pretty ribbon or decorative stickers, and place a picture of your family or make one for each child. 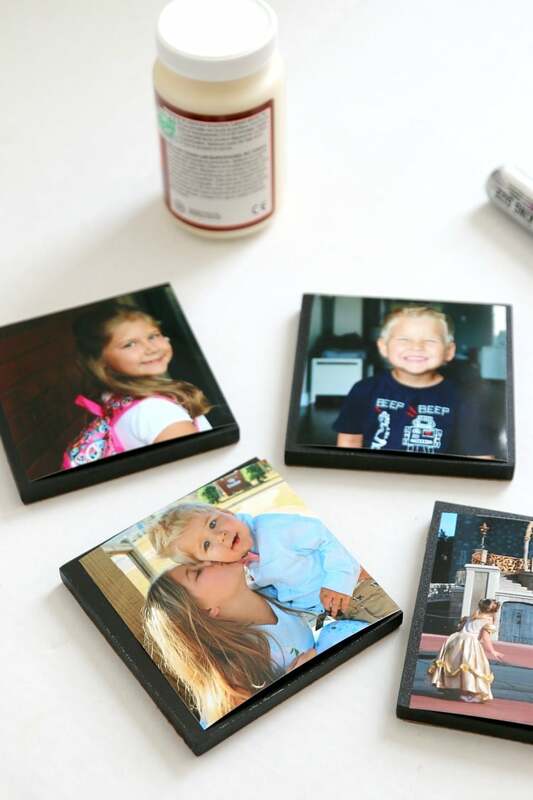 5 minute DIY Photo Coasters (MomDot): Make mom smile with these easy photo coasters that only take 5 minutes to make but are customized perfectly for mom! Album Pocket Watch (Crafts Unleashed): Great way to add pictures of all the children, in this adorable pocket watch craft. If you have younger children, you might have to help them with this one, but they can help pick out the pictures of each child and colors to use, so that they can have a part in the gift. Letter Photo Display (Blue I Style): Spell out mom or any other word you want with block letters. Then simply paint and add some pretty scrapbook paper to the letters, and then attach pictures of the children to each letters! This is such a fun craft and you can get really creative. Let your child pick out the colors and/or the pictures to attach to the letters! Flower Pot with Flowers (Mod Podge Rocks): This is such a cute one, print off different photos, and display them on a flower pot. Then add some pretty ribbon, and your mom’s favorite flower! Mother’s Day Photo Cube (All Parenting): Create a photo cube, with some of your favorite pictures of the family or kids, for mom! You could even add some scrapbook sides to add a pop of color to your cube!